The easiest way to print your profit and loss budgets is using the spreadsheet report. 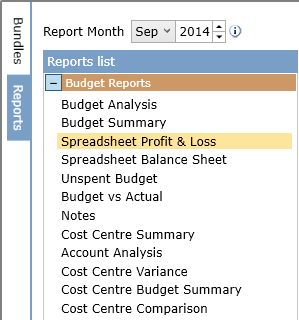 This report can be used to view, print and export multiple business unit budgets. For a detailed explanation on creating reports refer to the help note – Running Reports. Outlined below is the specific criteria to generate P&L budget reports. 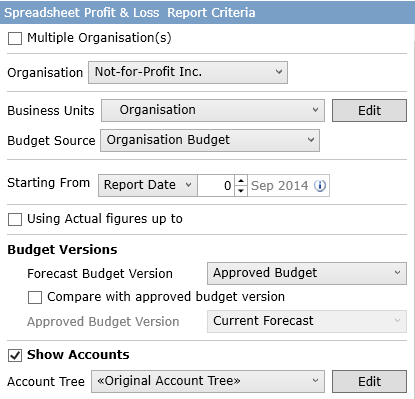 Select the Organisation, Business Units (Calxa Premier only), Budget Source and Account Tree (Calxa Premier only) to use. Set the Starting From field to the first month in the budget period and ensure the check box marked ‘Using Actual figures up to’ is unchecked. The budget report will be displayed. Using the tools provided you can also print, export or email this report.